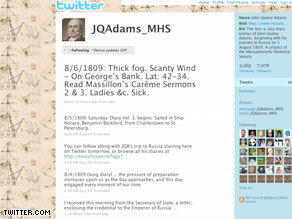 John Quincy Adams tweeted today about the 'thick fog' and 'scanty wind' on his way to Russia … in 1809. WASHINGTON (CNN) – John Quincy Adams "tweeted" today about the "thick fog" and "scanty wind" on his way to Russia … in 1809. Wait, did the social networking site Twitter exist 200 years ago? Of course not, but in a clever twist the Massachusetts Historical Society is converting his diaries into megabytes and blasting them out to the 7,000-plus group of followers who want to know what he had for dinner, what he is reading and what just popped into his head. "I received this morning from the Secretary of State, a letter, enclosing the credential to the Emperor of Russia ..." wrote Adams in his diary. Adams wrote these entries as he traveled to Russia as the first U.S. ambassador. He would later be elected as the nation's sixth president. Adams musings are about 110 to 120 characters long, and served as an index of his longer journal. His notes are strikingly similar to the everyday blasts that people write on Twitter.com these days. To view his tweets clock here @JQAdams_MHS.